The study analyzed tens of thousands of Twitter conversations over the past four years to reveal a "topographical map" of these patterns—each showing identifiable contours—based on the topic being discussed, the information and influencers driving the conversation and the social network structures of the participants. People tweet about anything and everything, but a new Twitter analysis coauthored by University of Maryland computer scientist Ben Shneiderman shows much of this conversation falls into six distinct patterns or networks. •Support Network/customer service conversations that revolve around a singular source. Shneiderman, a widely recognized pioneer in human-computer interaction and information visualization, co-authored the comprehensive new study with Lee Rainie, director of the Pew Research Internet Project, Marc A. Smith, director of the Social Media Research Foundation and Itai Himelboim, an assistant professor of telecommunications at the University of Georgia. This work is the first of its kind according to Shneiderman, who also holds an appointment in the University of Maryland Institute for Advanced Computer Studies. "There are already a number of academic papers that analyze the volume of tweets over time related to specific topics, and other research that gives good insight into sentiment analysis—the underlying message—of those tweets," he says. "What we've done doing is to provide a visual map of the Twitterverse that will ultimately help others to better interpret the trends, topics and implications of these new communication technologies." Rainie says the study "gave us a way to take the digital equivalent of aerial photos of crowds while simultaneously listening to their conversations." 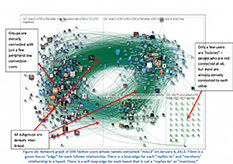 The researchers relied heavily on open-source software called NodeXL to interpret the data. Marc Smith led the initial development of this innovative software, but Shneiderman and his graduate students—many of them in the university's Human-Computer Interaction Lab—have contributed strongly to the analytical tool's use over the past six years. NodeXL allows researchers to examine the interplay of tweets, retweets and the social networks of Twitter users—the people they follow and who follows them. It can also be used to study Facebook, Flickr, email, scientific citations and other network structures. "This new field is emerging right before our eyes," Shneiderman says. "It could eventually have a large impact on our understanding of everything from health to community safety, from business innovation to citizen science, and from civic engagement to sustainable energy programs."